Fort Bassein, known also as Fort Vasai, is a ruined Portuguese fort located in the Maharashtra State in the western part of India. It was built during the 16 th century, and remained in the hands of the Portuguese for about two centuries, during which it prospered and flourished. During the 18 th century, the fort was captured by the Marathas, and then captured by the British several decades later. During its occupation by the Marathas and the British, Fort Bassein was neglected, and did not retain the status it once had under Portuguese rule. Today, the fort lies in ruins, though it is a tourist spot, and is also said to be a favorite location of Bollywood filmmakers. Bassein / Vasai is situated about 48 km (29 miles) to the north of Mumbai, the capital of the Maharashtra State. The city is located on the north bank of the Ulhas River, and is bordered by the Vaitarna River to its north. To the west of the city is the Arabian Sea. As Bassein is bordered by three bodies of water, it was an easily defended site. Prior to the coming of the Portuguese, this area was under the rule of various dynasties, including the Satavahanas, Rashtrakutas, Shilaharas, Yadavas of Devgiri, and the sultans of Gujarat. Bassein was clearly an important city, as it acquired its wealth from such activities as the horse trading, fishing and stone quarrying. Furthermore, the city was in the center of an agriculturally productive district. In 1528 / 1529, Heytor de Silveira, a Portuguese captain, captured and burnt the city of Bassein. On the 23 rd of December 1534, the Sultan of Gujarat, Bahadur Shah, ceded Bassein to the Portuguese, who was hoping to form an alliance with them in the face of Mughal pressure. The first two buildings built in 1535 by the Portuguese were a feitoria (trade post), and the Igreja de Nossa Senhora da Vida (the Church of Our Lady of Life). In the following year, the fort was built. The Portuguese town grew and flourished around the fort. Various buildings were built at Bassein in the following decades. Most notable, perhaps, are the churches. In 1547, for example, the Convent and Church of Santo Antonio, and the Igreja Matriz de São João (the Mother Church of St. John) were founded by the Franciscans, whilst the Jesuits founded the Igreja do Sagrado Coração de Jesus (the Church of the Sacred Heart of Jesus) and a college in 1549 and 1561 respectively. 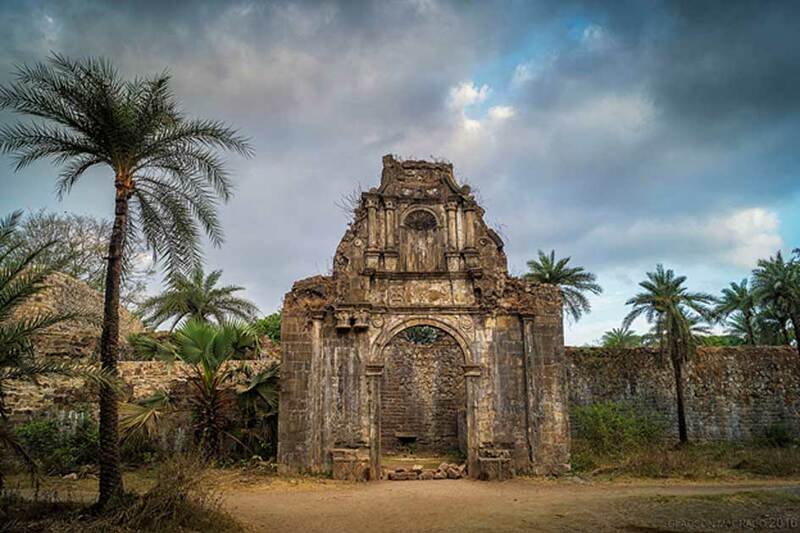 Speaking of the Jesuits, one of their most notable members, St. Francis Xavier, visited and stayed in Bassein in 1548, during which he succeeded in converting a portion of the native population to the Christian faith. The construction of a new fort also began in the second half of the 16 th century. As a result of this project, the entire town was surrounded by a circuit of walls with 10 bastions. Bassein continued to flourish during the 17 th century. In 1634, for instance, it is recorded that Bassein had a population of 400 Portuguese families, 200 Christian Indian families, and 1800 slaves. In 1674, Bassein had two colleges, four convents, and six churches. By this time, however, Portuguese power in the East was weakening, and the transfer of to the British in 1665 weakened the position of the fort. As a result of this, Fort Bassein was frequently attacked by the Marathas. In February 1739, the Marathas besieged the fort for one last time. Three months later, on the 16 th of May 1739, the Portuguese defenders finally surrendered. This siege is recorded to have cost the lives of 12000 Marathas and 800 Portuguese. The victors, however, did not hold on to their new possession for very long. Towards the end of November of 1780, the British were outside the walls of the fort, and began to besiege the Maratha defenders. On the 12 th of December, about half a month after the siege commenced, the Maratha garrison of 4000 strong surrendered. There was no serious attempt by the defenders to break the siege, and a possible explanation for this is that morale amongst the soldiers was low. The British retained possession of the fort until the independence of India in 1947. Nowadays, the ancient ruins have become popular as a setting for a number of Bollywood films. Naravane, M. S., 2006. Battles of the Honourable East India Company: Making of the Raj. New Delhi: A.PH. Publishing Corporation.